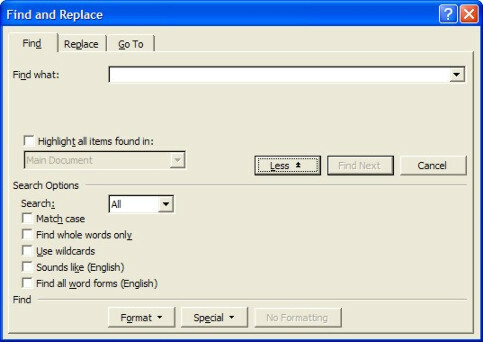 Ms Word Find and Replace - Translation Solutions Ltd.
Now THIS is one of the greatest functions of Word so far as we are concerned. If you ask some find and replace pros, you could be lead to consider that Find and Replace is a way of life. This article will NOT get you there. But it describes the basics and gets you started. If you are looking for a specific term, just enter it in the box and click “Find next”. If the word is in the text, Word will find it and position the cursor on it. Let us say you have a difficult word and you lack context. One of the first things you should do is to look if the word is not reused or even defined later in the text. Look for it with the Find function and if the word is reused, you will be able to get more contexts, and every so often, a definition. In the Search Options, there is a drop down list, with “All” as a default. This is the search direction. You can search the whole document at once, search from the insertion point toward the end of the document (Down), or toward the beginning of the document (Up). Next is the “Match case” option case. If you click on it, Word will only look for words or expressions which have the same case as the search string you typed. I.E. : If you search for “Word” without that option, Find will show “word”, “Word”… With this option case checked, only “Word” will come up. When “Find whole words only” is activated, Word will look for complete words, not part of. For instance, if you were looking for “part”, Word would normally find “part”, “parts”, “partake”, “partition”, “department”,… any word that contain “part” in your document. With “Find whole words only” activated, Word will find only “part”. Use Wildcards. See later. This option deserves a longer explanation. “Sounds like” (English) allows you to look for words that “sound like” your search expression. For example, you are not sure how a word is spelled, or how it was spelled, you can use that option to find it anyway. I.e. : If you look for “opsion”, Word will find “option”. It won't always work though.